Our astrological sign depends on the position of the sun at the time of our birth. But the moon also has things to say about our personality. Being feminine, it reveals our most secret character traits, releases our intuition and our emotions. 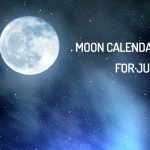 Discover quickly the lunar calendar for July and how the moon influences your life. Clinging to your freedom, you will not allow anyone to imprison you. You are teeming with new ideas, but you lack patience and you do not always go after your ideas. This is the influence of the Moon in Aries. Discover more about the Aries Horoscope for July here. The moon stabilizes you. You are always afraid of missing something. Also, you always have exit doors, in case you have difficulties. This is the influence of the Moon in Taurus. Discover more about the Taurus Horoscope for July here. You are imaginative, and you flourish in creative activities. Hyperactive, you get bored quickly when you have to stay static. You are curious, and you like to learn. This is the influence of the Moon in Gemini. Discover more about the Gemini Horoscope for July here. This is your home, you are like it: endearing and distant at the same time. Everything happens under the surface. But once confident, you exteriorize yourself, to surprise. This is the influence of the Moon in Cancer. Discover more about the Cancer Horoscope for July here. You are warm and extroverted. Your open mind always ensures you interesting meetings. But when you give in to the emotional, you become vulnerable. This is the influence of the Moon in Leo. Discover more about the Leo Horoscope for July here. You are a household maniac. In short, you are a perfectionist. Be careful, if you continue this way, you may be disappointed. This is the influence of the Moon in Virgo. Discover more about the Virgo Horoscope for July here. You hate loneliness. You charm with every turn, and your address book is well filled. But you also have a lot of trouble solving problems and managing conflict. This is the influence of the Moon in Libra. Discover more about the Libra Horoscope for July here. Your feelings are intense. You always oscillate between love and hate, sadness and happiness. In short, you are angry. This is the influence of the Moon in Scorpio. Discover more about the Scorpio Horoscope for July here. True chameleon, you have the art of adapting to all situations. You are curious, extrovert, etc. In short, irresistible. Others love you and forget about your lack of diplomacy. This is the influence of the Moon in Sagittarius. Discover more about the Sagittarius Horoscope for July here. Gifted for studies, you like to learn. But your pessimistic nature makes you stay in the shadows. This is the influence of the Moon in Capricorn. Discover more about the Capricorn Horoscope for July here. You are rebellious. Your thirst for freedom knows no bounds, and you unreservedly assume your original ideas. This is the influence of the Moon in Aquarius. You are insightful, so it is absolutely impossible to lie to you. Your intuition is ultra-developed: thanks to it, you instinctively make the right decisions. This is the influence of the Moon in Pisces. Discover more about the Pisces Horoscope for July here.